The discovery of a priceless artifact puts Julia’s life in great danger! From valuable artifacts to shady businessmen, the Yucatan Peninsula becomes a dangerous vacation spot for John and Julia Evans. While on assignment for the newspaper, the Evanses try to enjoy a romantic vacation among the Mayan ruins, but when Julia accidentally comes upon a couple suspicious men exchanging an item, she quickly turns and leaves but it is too late. The men have seen her. As a reporter, Julia does not easily give up and her curiosity gets them in a mess of trouble. Before John and Julia realize what is going on, they are both in danger and find themselves running for their lives through the jungles of the Yucatan. You can find Linda online at http://www.lindaweaverclarke.com/index.html and at her blog found at http://lindaweaverclarke.blogspot.com/. 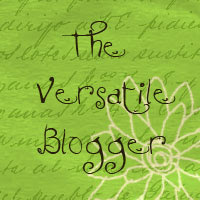 She is having a week-long celebration at her blog that includes a book giveaway, so make sure you stop by. This summer has just flown by and we're now down to the final two weeks of The Book Connection's Summer 2010 Book Giveaway. Book Pack # 9 is hard for me to part with. I truly enjoyed these books; three of them are signed by the authors. I just happen to hate clutter more than I love great books. If we ever build another house, I will have one room designed with floor to ceiling bookshelves on at least two sides. Then I might have enough room. An autographed copy of Bob Avey's Beneath a Buried House . 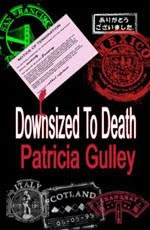 The second book is an autographed copy of Downsized To Death by Patricia Gulley. The Last Jew Standing by Michael Simon is just one of his Dan Reles novels. My review can be read here. Last, but certainly not least, is an autographed copy of the true military crime novel, Murder in Baker Company: How Four American Soldiers Killed One of Their Own by Cilla McCain. Retail Value of Book Pack #9 is $85.80! 4. You will receive two additional entries for every friend you refer to this contest. Your friend must become a follower of the blog and leave a comment indicating who referred him/her. Use Blogger IDs when listing who provided the referral, so they are easily traced back to the correct person. No anonymous entries are allowed. 5. You will receive one additional entry for tweeting about this contest. Leave a link to your tweet here. 6. You will receive one additional entry for following my other blog, Book Tours and More. Leave me a comment here telling me you're now a follower of BTM. This giveaway is only open to residents of the United States and Canada. No emails will be sent to notify the winner. The winner can claim his/her prize by clicking the Contact Me button in the sidebar and sending along his/her mailing address. 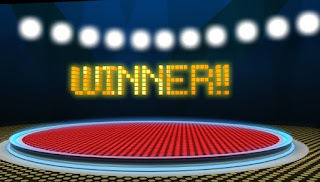 All winners have 72 hours after their names are announced to claim their prizes. An alternative winner will be selected after the 72 hour window has passed. If you win a prize, please wait one week before entering another giveaway. Prizes will be shipped media mail through the United States Postal Service. We are not responsible for lost or damaged goods. Deadline to enter is 11:59 PM on Saturday, September 4, 2010. Only those who follow the rules of this contest will be eligible to win. Book Pack #8 Giveaway Winner! Congratulations goes out to Susanne, winner of Book Pack #8 in The Book Connection's Summer 2010 Book Giveaway! Susanne now has 72 hours to contact us with her mailing information. Our contact button is in the sidebar. If we don't hear from her within 72 hours, we'll select another winner. Thanks again to all who participated last week. This week's giveaway will be posted soon! Book Pack #7 Giveaway Winner! Congratulations goes out to Martha Lawson, winner of Book Pack #7 for children in The Book Connection's Summer 2010 Book Giveaway! Martha now has 72 hours to contact me with her mailing address. If I don't hear from her by then, a new winner will be selected. Thanks to all who participated. Look for this week's giveaway, coming soon! 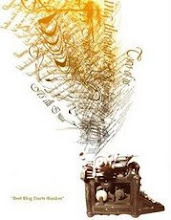 Today I would like to welcome back to The Book Connection, author Linda Weaver Clarke. 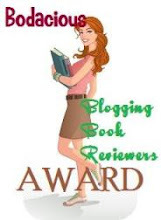 As my readers know, Linda interviews authors and runs giveaways at her blog. Now it’s her turn to be interviewed. While I am familiar with her A Family Saga in Bear Lake, Idaho series, I don’t know a lot about her new series, which includes the books, Anasazi Intrigue and Mayan Intrigue. I’m sitting down with Linda today to talk about this new mystery series and discuss how writing in two genres can be both similar and different. Welcome back to The Book Connection, Linda. It’s been a while. Why don’t you give my readers a brief refresher course on who is Linda Weaver Clarke? LWC: I was raised on a farm surrounded by the rolling hills of southern Idaho and made my home in southern Utah among the beautiful red mountains and desert heat. I am happily married and the mother of six daughters and have five grandchildren. I also travel throughout the United States, teaching a “Family Legacy Workshop,” encouraging people to write their family history and autobiography. I loved the first book in your A Family Saga in Bear Lake, Idaho series, Melinda and the Wild West . What made you decide to sit down and write these books? LWC: I was so inspired after reading my own ancestors’ stories that I wanted to create fictional characters and give them similar experiences from my ancestors. There are five books in this series. It was so much fun. For example, my great grandmother, Sarah, lost her hearing at the age of one when she was very sick. Even though she was deaf, she was known as one of the most graceful dancers in town. She was a beautiful woman with black hair, blue eyes, and was 5’ 5” tall. Nothing held her back. She was an independent and spunky woman. One day, she felt that an intruder was in her home so she grabbed her broom and searched the house. She found him under her bed. With all the power and strength she had, she swatted him out of the house and down the street, pummeling him as she went. My great grandmother was an inspiration to me, so I gave her experiences to my character in David and the Bear Lake Monster. I even named her Sarah, after my great grandmother. Now, you’re known as a lover of genealogy and for incorporating your family’s past and experiences into your novels. Did this happen with your new series as well? LWC: I couldn’t help but add true experiences from my own life with my husband and children. In fact, I patterned the three teenagers in this series after my last three daughters. They laughed when I told them what I did. Of course, I tell my readers in the Author’s Notes what is actually true. My readers seem to like that bit of info. Let’s talk more about The Adventures of John and Julia Evans series. You’ve got two books out now. 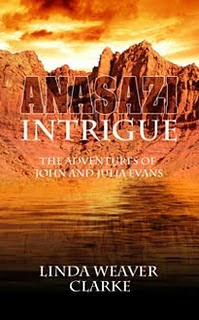 Tell us a bit about Anasazi Intrigue and Mayan Intrigue . LWC: In Anasazi Intrigue, it all begins with a devastating flood, which takes out several homes in a small town in southern Utah. Julia Evans, the town's newest reporter, is shocked by the news of a poison spill that kills many of the fish and neighbor's pets. Intrigued, she jumps into action and begins her investigation. Quickly though, Julia realizes the story and investigation are much bigger and more dangerous than she thought! Julia and her husband find themselves on the run trying to save their lives while finishing the story of a lifetime. She never realized that being a reporter could be so dangerous. With artifacts, dead fish, a devastating flood, and miscreants, John and Julia have their hands full. The Evans are not the ordinary couple. Together they investigate and solve crimes. You laugh at the humor and sigh at the romance. Just sprinkle in three grown daughters, and you have a fun mixture. 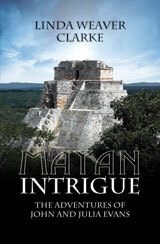 Mayan Intrigue is set in the jungles of the Yucatan. The Mayan ruins, looters, a mysterious artifact, and a nosey reporter are focus of this novel. The discovery of a priceless artifact puts Julia’s life in great danger! From valuable artifacts to shady businessmen, the Yucatan Peninsula becomes a dangerous vacation spot for John and Julia Evans. While on assignment for the newspaper, the Evans’ try to enjoy a romantic vacation among the Mayan ruins, but when Julia accidentally comes upon a couple suspicious men exchanging an item, she quickly turns and leaves but it is too late. The men have seen her. As a reporter, Julia does not easily give up and her curiosity gets them in a mess of trouble. Before John and Julia realize what is going on, they are both in danger and find themselves running for their lives through the jungles of the Yucatan. Why did you decide to switch genres and what inspired you to write these particular books? LWC: I wanted to try something different. The ancient American Indians, their way of life, and the subject of artifact theft have fascinated me for years. Both the historical and mystery series required a great deal of research. Did you discover either genre to be easier or more difficult to fact find? LWC: I love research and it’s never been difficult for me. In this series, I found that archaeological thievery is becoming more and more of a problem every year. Did you know that an ancient funeral pit could be sold for $60,000 on the black market? Not to mention all the pottery, baskets, and pendants found by looters. Looting is only second to selling illegal drugs. Did you know that archaeological theft has gone corporate, like any legal business? An article in the Las Vegas Newspaper was about a couple men who were loading some artifacts in the trunk of their car. A ranger saw what they were doing and questioned them. He didn’t realize he had accidentally stumbled upon the largest operation around. They recovered more than 11,100 relics. It’s a very intriguing subject and I enjoyed learning so much in my research. Actually, since you’re dealing with ancient artifacts, you haven’t totally come away from your historical writing—only blended it with romance and suspense. How much fun did you have with that? LWC: I found that switching from historical romance to mystery wasn’t easy. It’s a totally different mind set but I absolutely loved the challenge. Can you tell our readers where they can find you on the web and where they’ll find your books available for purchase? 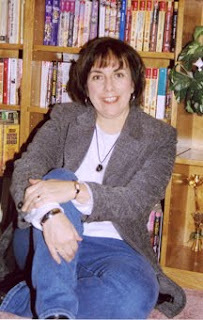 LWC: You can visit my website and read some sample chapters of each book at www.lindaweaverclarke.com. My books are available at Amazon and at Publisher Direct Bookstore on my website. The family saga books are actually discounted on Publisher Direct. Any bookstore can order them, also. LWC: I’m now working on Montezuma Intrigue with my editor. When a leather parchment of Montezuma’s map is found in great grandfather Evans’ old chest, April and the twins know this summer is going to be a memorable one. With Julia’s help, they convince John to go on a treasure hunt. Is Montezuma’s treasure a legend or reality? Whatever the case, John insists on keeping their little Treasure Hunt a secret. If certain people find out about it, the family could be in danger. During this little escapade, Matthew, a kindred friend to April, is trying to get the courage to tell her that he truly loves her. LWC: Right now I’m having a book give away for Mayan Intrigue beginning August 30 to September 6 at http://lindaweaverclarke.blogspot.com. I’m celebrating the release of my new book. Thanks for spending some time with us today, Linda. It’s always a pleasure to talk with you about your books. I wish you continued success. Tune in tomorrow for a peek at the video trailer for Mayan Intrigue! 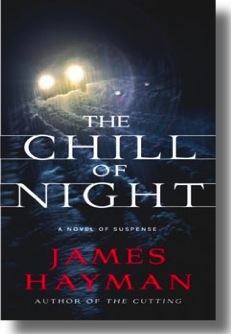 Portland homicide detective Michael McCabe returns in The Chill of Night by James Hayman. When the naked frozen body of young attorney Lainie Goff is found in sub-zero temperatures at the end of the Portland Fish Pier, detective Mike McCabe and his partner, Maggie Savage, are called in to investigate. They soon discover the only witness to the crime--a mentally disturbed woman named Abby Quinn--mysteriously disappeared the same night. McCabe is on the track of a clever killer, who may or may not know that Abby is the one who witnessed the crime. He must find Abby and the killer before another life is lost. Things at home aren't so rosy either. A phone call from McCabe's ex-wife concerning their daughter, Casey, and relationship issues with Kyra, leave McCabe rethinking his past and present, and wondering about the future. In this follow up to The Cutting , Hayman brings back Mike McCabe, Maggie Savage, and other members of the Portland PD to handle the investigation of the mysterious death of a glamorous, beautiful lawyer, who was moving swiftly toward a partnership in a prominent law firm. Hayman does an excellent job, as he did in the first book, of creating a suspenseful mystery for his characters to solve. Twists and turns keep the reader guessing the identity of the killer right along with McCabe. Hayman also does a fine job of describing the world in which McCabe lives and works. McCabe's personal life is well drawn in The Chill of Night, as he is once again dealing a bit with his ex-wife, and complications arise in his current relationship with girlfriend, Kyra. My tiny complaint, which actually is a carry over of my feelings from the first book, is that his daughter, Casey, seems to be used solely to give McCabe an eternal tie to his past. In The Cutting, his ex-wife Sandy reappears after she had left Casey behind so she could marry another man. While Sandy's emergence causes conflict, and Casey is mentioned in several chapters of the book, I came away feeling like she was just a pawn the author used to keep McCabe tied to his past. Chapters would go by without a mention of Casey, and you were wondering what the heck she was doing all that time. I didn't cite this in my review because I thought I was being a bit too picky. In The Chill of Night, however, Casey is absent for most of the book, having gone off with a friend on a trip. While she returns toward the end, I couldn't help but think how convenient her absence was. Though McCabe mentions her a couple of times, it nags at me that I didn't get to see more of them together. It's almost like watching an episode of a television show where you know kids exist, but they are barely mentioned or seen; kind of like having to wonder where young Grace was while Caroline was working at the restaurant in Little House on the Prairie. It is my hope that Casey plays a deeper, more significant role in future installments of this series. While I'm reading these for the murder mystery, I still need to get to know McCabe as a person, the whole person, not just his work persona or as Sandy's ex-husband or Kyra's boyfriend. His being a single father is an important part of his character, and will hopefully be further developed. That said, I felt The Chill of Night was a great addition to a series I am very excited about. I'll certainly be on the lookout for Hayman's next book. 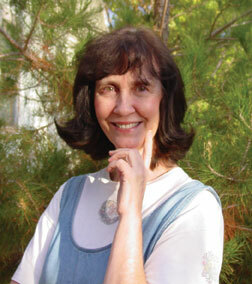 Today's special guest blogger is Kathryn Shay, author of The Perfect Family . Seventeen-year old Jamie Davidson doesn’t think being gay should be such a big deal…until he comes out to his parents and friends. Even as Jamie celebrates no longer needing to hide his true self and looks forward to the excitement of openly dating another boy, the entire Davidson family is thrown into turmoil. Jamie’s father Mike can’t reconcile his religious beliefs with his son’s sexuality. His brother Brian is harassed by his jock buddies and angry at Jamie for complicating all their lives. Maggie, his mother, fears being able to protect her son while struggling to save her crumbling marriage. And Jamie feels guilty for the unhappiness his disclosure has caused. What happens in their small town community, in the high school, in two churches–one supportive and one not—as well as among friends and relatives is vividly portrayed. Finally, every member of their “perfect family” must search their hearts and souls to reconnect with each other in this honest, heartwarming, and hopeful look at the redemptive power of love and family. Thanks for inviting me to blog on your site. First, let me introduce myself. I’m Kathryn Shay and I’ve been published by Harlequin and The Berkley Publishing Group for the last fifteen years. The Perfect Family, released from Bold Strokes Books in September, is my thirty-seventh book. The question posed in the title of this blog, “Is there such a thing as a perfect family” has a simple answer--a definite no! So why is it the title of my new book? The story is about an average family with devoted parents and two terrific sons. Mike and Maggie love their jobs and have close friends and extended family. The boys, Jamie and Brian, are happy in their environment, one an accomplished actor in school plays, one a star athlete for the baseball team. Their life is wonderful and they are extremely grateful for this. Maggie came from a dysfunctional childhood with severe, sometimes cruel parents, a beloved sister who was disowned by them, and two other siblings she doesn’t always see eye to eye with. Her mother is still alive and causes Maggie great heartache. Because of this, Maggie has vowed to create “the perfect family” of her own. And she thinks she’s done this. But then Jamie tells them he’s gay and their world shifts. Mike, a loving, giving man, struggles with Jamie’s sexual orientation mostly because of the Catholic church; Brian is harassed at school by his jock buddies and makes poor choices because of it; and Maggie tries to keep the family together amidst her own concerns for her son and the heartbreak of watching him endure discrimination. It becomes very clear that their family isn’t perfect, and the Davidsons have to struggle to maintain their loving relationship during this difficult time. Hence, The Perfect Family is an ironic title. An overriding theme of the book is that even in a good family, problems occur and it’s important to work them through with unconditional love and support. I know personally that there is no such thing as a perfect family. I was a high school teacher and saw families in conflict all the time. Even when there were super parents and super kids involved, problems arose. Thank God for unbiased teachers who help kids with these issues. In my own English class, I taught Ordinary People, by Judith Guest, which also shows an ostensibly perfect family in crisis. Kids really related to the book, as did I. As for myself, my extended family of two parents and four siblings was far from perfect, but my sisters, brother and I managed to create good successful lives. We’re still close and there for each other. I must confess that, like Maggie, I set out to create the perfect nuclear family, too. I learned more quickly than Maggie that this isn’t possible. I love my kids and husband more than anything in the world, but I made mistakes with them. However, we learned from our problems and though the kids are grown now, my husband and I enjoy a wonderful relationship with them. So that’s a long answer to why I believe there’s no such thing as the perfect family but titled my book as such anyway. I hope you’ll read The Perfect Family to see how this story is played out. By the way, though the book is fiction, it has some elements of my own personal story when my son came out gay at seventeen. We had our ups and downs, too, but managed to stay loving and supportive. And we have a gift for readers: we’re giving away copies of a CD my son made in high school. Many of the songs are about loving a boy. You can get it free when you order from the Bold Strokes website at http://www.boldstrokesbooks.com/products.php?product=Perfect-Family%2C-The-%252d-by-Kathryn-Shay. Or, depending on availability, you can and also get it from my website, www.kathrynshay.com. I’ll come back to comment during the day. Many people ask about my next book. I’m working on new projects now, but I’d also like to say here that if readers are interested in my backlist, I’m making plans to put nine previously published single title books up on Kindle and Smashwords by the time The Perfect Family is released. Since that first sale, Kathryn has written twenty-five books for Harlequin, nine mainstream contemporary romances for the Berkley Publishing Group, and two online novellas, which Berkley then published in traditional print format. Her first mainstream fiction book will be out from Bold Strokes Books in September, 2010. Paula Deen lovers are going to eat up this great new addition to the Paula Deen line of products. 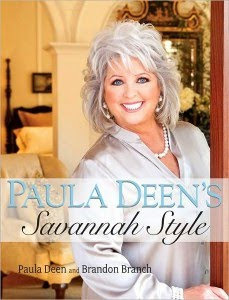 Paula Deen's Savannah Style invites readers to take a look into the styles that make Savannah unique and interesting to people all around the world. Along with the help of decorator and stylist Brandon Branch, Deen brings readers on a season-by-season tour of rooms (indoor and outdoor) that display what Savannah style is all about. With photographs by Deborah Whitlaw Llewellyn, you'll be inspired to bring a bit of Savannah into your home too. Until now I've pretty much managed to avoid the Paula Deen, Martha Stewart, and Rachel Ray crazes that entice my friends. I don't watch a lot of TV, so I've never seen Deen's show on Food Network. As a homeowner, however, and someone who enjoys visiting North Carolina every year, I wanted to see what Paula Deen's Savannah Style is all about. While our family hasn't made its way as far as South Carolina, there's a definite difference in style and culture from the New England states that depicts an easier pace where food and family are celebrated with gusto. Both Deen and Branch offer a nice introduction to the readers, inviting them to come along on this journey through Savannah. Starting with the spring season and flowing through casually to winter, readers are treated to tons of stunning photographs of decorating ideas in all types of rooms: from porches to gardens, from decks to kitchens, and formal dining rooms to comfortable reading spaces, everyone will find new ways to bring Savannah into their homes. Included throughout are "Brandon's Style Secrets" where Branch shares his experience on furniture, lighting, and fabric choices for every room in your house. A helpful Source Guide can be found at the end of the book, and includes web addresses and phone numbers in case you are interested in contacting certain vendors. What's truly nice about Paula Deen's Savaanah Style is how Deen shares family memories throughout the book. This is a great book for anyone's Paula Deen collection, but it also would make a wonderful choice for any homeowner who is searching for ideas and inspiration. It's truly worth every penny! 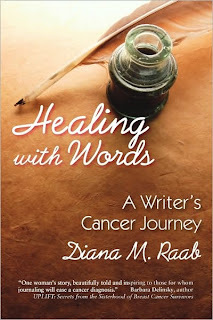 Beautifully written, powerful, and inspiring, Healing With Words: A writer's cancer journey by Diana M. Raab will touch your heart and encourage you to use your writing to ease your suffering and improve your overall health. 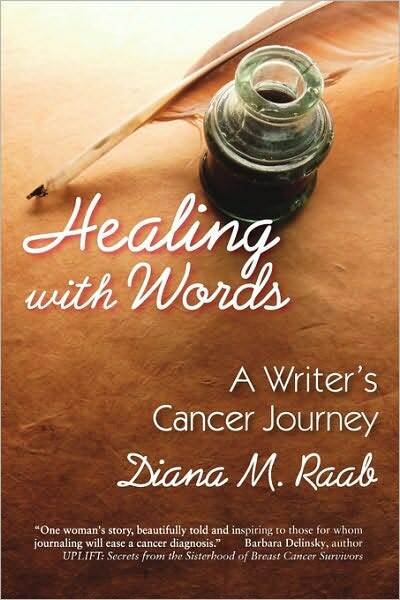 In this emotional memoir, author Diana M. Raab shares the story of how her life was shattered by her first cancer diagnosis. Raab would face her mortality again, five years later, when she was diagnosed with multiple myeloma; a battle she continues to wage and is determined to win. I had selfish reasons for requesting this book. For those of you who might not know, my mother was diagnosed with breast cancer at the age of 45. Cancer returned a year later, and she died a week before Christmas at the age of 47. I found the first lump in my breast when I was 25. Writing helped me cope with the grief of losing my mother when I was a young teen. I still keep a journal, though since I began blogging, it hasn't seen as much time as it used to. Healing with Words made me cry, it made me sympathize with what the author had to--and still has to--endure. The majority of patients diagnosed with multiple myeloma will die from it. Perhaps this is why Raab can share her story with such grace and compassion. Whatever the reason, I admire her for it. When she spoke of the anxiety over waiting for test results, I understood her. The three weeks I waited for the results of my genetic testing to see if I had a mutated gene that would highly increase my risk for breast cancer, were the most difficult weeks of my life. Not knowing how my life would change if the test came back positive seemed unbearable at times. And then when Raab discussed the sense of loss before and after her mastectomy, I thought of my mother, and also what might have been in my future--could still be. What ties all this together nicely, is that in Healing with Words, the author shows how journaling can impact your overall health. Included are some poems Raab wrote since her original diagnosis and on through her continuing journey. In addition, each chapter ends with thought-provoking questions and plenty of blank space for the reader to write. On Page 7 it says, "Write about the day you first thought you had cancer." While I have been fortunate never to actually have been diagnosed, let me tell you, that first lump scared me as if it was already a forgone conclusion that I was going to lose a breast. Healing with Words is a phenomenal book. Not only will you read one woman's story, you will be changed by it. This is the second giveaway that is being listed for this week in The Book Connection's Summer 2010 Book Giveaway. There will only be two more book packs available after this one, so keep an eye out for these every week. Recipes for Enchantment, The Secret Ingredient is You! by Dr. Barbara Becker Holstein. I've been a fan of Dr. Barbara's books since I was first introduced to THE TRUTH, I'm Ten, I'm Smart and I Know Everything! . All of these stories in this collection focus on the positive aspects of life, inspiring you to do the same. You'll meet Joey, a young cancer patient whose attitude and perception of events help him to believe he'll be well again. Then there's Mr. Diamond who completed his circle of life by returning to the city he once had to flee. Read how Bernadette Hoyer's memory of a childhood pet reminded her of a great act of love from the father she had lost. And meet The Mysterious Rabbi who shows the meaning of serving others. With contributions from Bernice Becker, Leslie Brittman, Emily Doherty, Bernadette Hoyer, Doreen Laperdon-Addison, Sherri Rosen, Ellen Saposnik, Sylvia Schultz Margolin, Tzvia Singer, and Claire Wintram this story collection will find you feeling better about your life and motivated to keep finding the positive side of things. Delight , also by Dr. Barbara Becker Holstein. In this book women can find a way to celebrate life in a meaningful way. Holstein takes readers along on a journey from her lack of involvement in the Jewish faith to her complete commitment as a member of the Judaic tribe, sharing with readers the delight she discovered in the revelation that we are all connected. And at the end of a story, Holstein draws readers into her discovery by providing them musings, ponderings, and reflections on how they, too, can discover delight. My complete review appears here. Blogger's note: Includes a free matching bookmark. 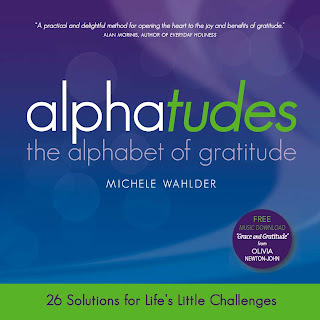 Also included is my last ARC of Michele Wahlder's Alphatudes: The Alphabet of Gratitude . 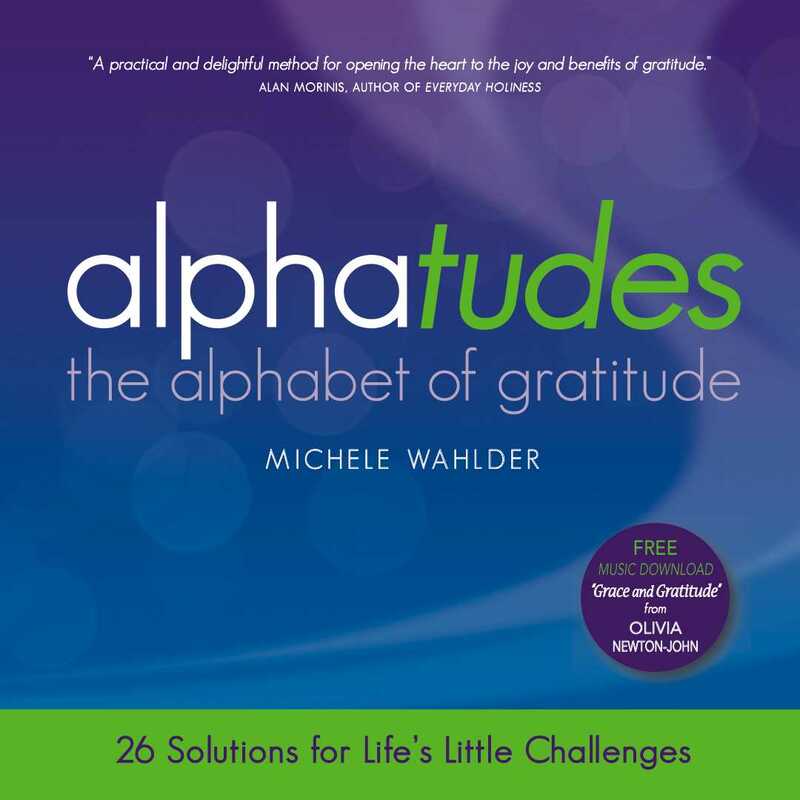 Alphatudes uses the alphabet to provide readers with simple ways to focus on the positive. From acceptance to laughter, and from passion to voice, this book will give you twenty-six easy ways to discover the secret of gratitude. Retail value of Book Pack #8 is $40.44! This giveaway is only open to residents of the United States and Canada. No emails will be sent to notify the winner. The winner can claim his/her prize by clicking the Contact Me button in the sidebar and sending along his/her mailing address. 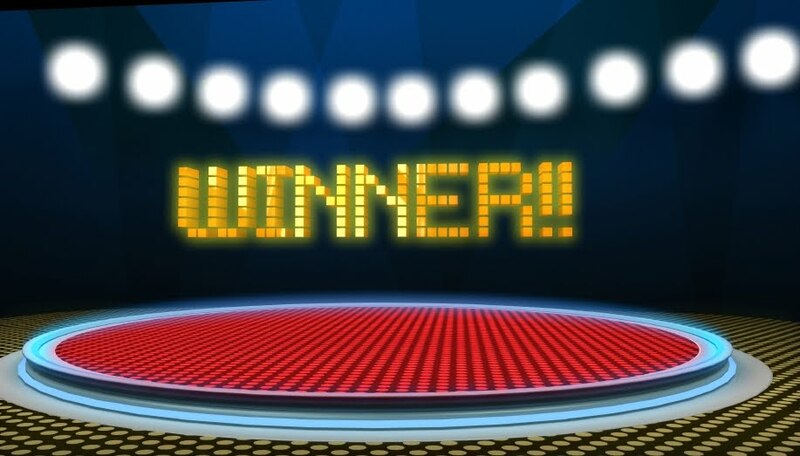 All winners have 72 hours after their names are announced to claim their prizes. An alternative winner will be selected after the 72 hour window has passed. If you win a prize, please wait one week before entering another giveaway. Prizes will be shipped media mail through the United States Postal Service. We are not responsible for lost or damaged goods. Deadline to enter is 11:59 PM on Saturday, August 28, 2010. Only those who follow the rules of this contest will be eligible to win. This will be another two book pack week. Are you feeling lucky? There are only two weeks left until The Book Connection's Summer 2010 Book Giveaway is over. Even if you're not interested in a certain book pack, tell your friends so they can enter to win too. I'll post Book Pack #8 in a separate entry. Be Cool, Follow Earth's Rule by Penelope Ann Kysiak. In this rhyming tale, a young girl asks her father about the flowers that grow in their garden. She soon learns how helpful the garlic flower is and why her family plants their own vegetables. She soon discovers the importance of conserving water and energy and encourages the reader to do the same. I won this book from another blog giveaway. I read it and shared it with my kids. Now, I want to share its wisdom with others. The Raindrop by Brian D. McClure. With The Raindrop, readers are treated to an enjoyable story along with a touch of science and a great message. 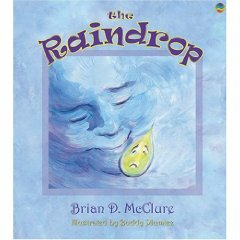 Through lyrical prose the author shares the Raindrop’s journey and all he learns along the way. Blogger's note: When I received this book, it had a slice on the back cover. It looks like it was sliced at some point by a razor blade. I was able to tape the inside, but it is still slightly visible from the outside back cover. 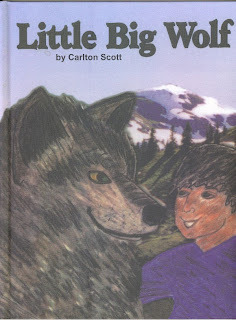 GLAMOUR GIRL FROM THE STARS and Little Big Wolf by Carlton Scott. 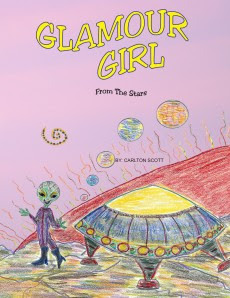 Glamour Girl from the Stars is the story of PleeDee, an alien girl who borrows her father’s spaceship to come to earth for the Miss Universe Pageant. After traveling around earth and experiencing different cultures, PleeDee soon discovers she feels good about herself without entering any beauty pageants. 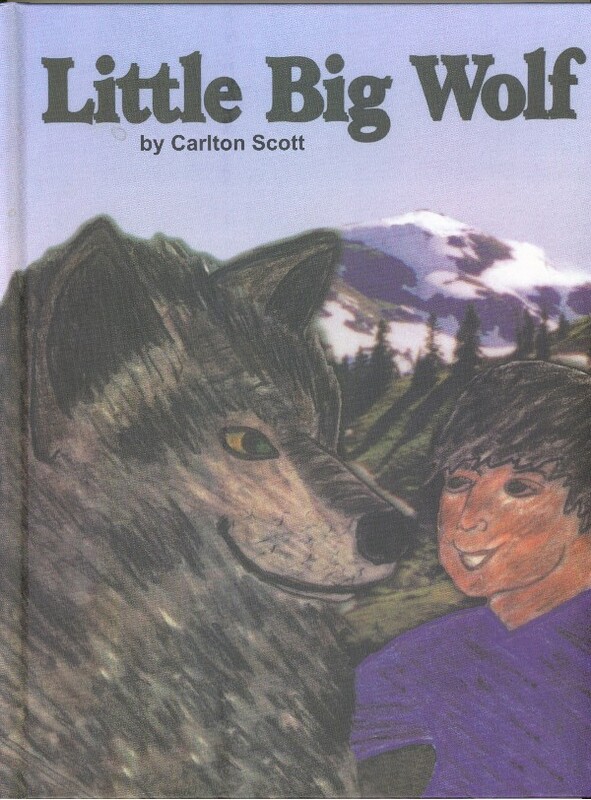 In Little Big Wolf, Nathan dreams he is exploring the rocky trails of the forest when a large wolf pounces. Suddenly the wolf appears nervous, and Nathan and he stumble upon two hunters. Nathan soon discovers the other source of the wolf’s anxiety, a pup that is too sick to play. Nathan tends to the pup, then he and the wolf continue their adventure. You can read my reviews of these books here and here. Retail value of Book Pack #7 is $51.85! Book Pack #6 Giveaway Winner! Book Pack #5 Giveaway Winner! Book Pack #4 Giveaway Winner! Penguin 75th Anniversary Book Giveaway Winner!